As a little girl, I loved paper dolls (and Barbie), dressing them up in multiple combinations of skirts, tops, jackets, handbags and shoes. What fun I had. And now, I have the grown-up version, the Boden Outfit-maker. As you know, I'm a big Boden fan, and they've recently introduced this new feature on their website by which you can pick and choose any item from their website and put it on a paper model (who looks more like Katherine Heigl with dark hair than me, but, hey, one can dream). I find that it doesn't work perfectly - it has trouble recalling my saved wardrobe in Internet Explorer 8, and in Chrome, you need to refresh the page to see the wardrobe, but it's so much fun. I don't like shopping, going through endless rails of ugly clothes to find the one thing that might suit me, queuing to a changing room, only to find that my bum looks big in this. I don't enjoy it. I don't see the point. So, when Rita told me about Boden, and I liked the clothes, I was hooked - everything in clear view, everything matching, and knowing that a size 10 will fit me, and then the excitement of opening the lovely box when the postman delivers it 7-10 days later. Who says you can't play with paper dolls when you're a grown-up? Still trying to catch up - 2 books I got from Mary: The Clothes on their Backs by Linda Grant and The Guernsey Literary and Potato Peel Pie Society by Mary Ann Shaffer and Annie Barrows. The first one, The Clothes on their Backs follows a young woman, a daughter of Hungarian immigrants in London, and how she discovers her family's past, as her parents don't want to talk about it (they barely leave their flat, so afraid of everything are they). It's a good story, and the parts set in Hungary were very interesting, but I didn't warm to Vivien, the main character of the story. I'm glad I read it, as it's very well written (It got shortlisted for the Man Booker Prize 2008), but I don't think I would read it again. The Guernsey Literary and Potato Peel Pie Society (what a mouthful) is a story set in the Channel Islands after World War II. 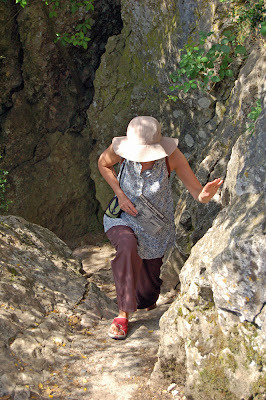 It follows Juliet, an English writer, who ends up on Guernsey and falls in love with the place. It's written through an exchange of letters between Juliet and many other characters - her best friend, her editor, and various members of the said Society. It's a lovely story, that takes its time to develop, and has a few surprises (including an Oscar Wilde manuscript). I knew nothing about Guernsey, but after reading this book, I wouldn't mind visiting some time - it sounds like the sea is everywhere and the light keeps changing. Probably a good spot for painters. Sadly, Mary Ann Shaffer died before the book was published, and her niece, Annie Barrows, took over and saw the book through to publication. I'm glad she did. This movie won an Oscar for best Picture in 2005 I think. And yet, we'd never heard of it. Remember, it's the movie that won instead of Brokeback Mountain, which everybody had expected to be the winner that year. Have a look at the link above to check out the other movies that got Oscars that year - I've actually seen most of them, and I had at least heard of every single one of them, except Crash. Crash was on the telly a short while back, and I found it to be an excellent movie. It's set in LA, and follows some unconnected characters through a couple of days and nights, some in the LAPD, some on the other side of the Law, some ordinary people who get caught up in it all, Black, White, Latinos, Asians, and of course, it's really all connected together. It is violent, but nothing turns out like you expect. It's a thoughtful exploration of racial prejudices, and there are some hilariously funny lines in it too. And Sandra Bullock plays a completely different character from her usual. Well worth renting on DVD. PS: don't read the "Characters" section in Wikipedia - it will spoil the movie for you. We were at the U2 concert in Croke Park on Monday. Wow. It was a fantastic show. We had quite good seats, in the Cusack stand, not too high, and we had a great view of the stage. But I don't think it matters where you were, as the way they had live close-ups on the 360-degree screen above the stage made you feel like you were in the "inner circle". Actually, I think that those in the inner circle didn't have as good a view of the "claw", or of the stage even, if one of the bridges happened to be right over their heads. And the smoke coming out of the stage can't have been too pleasant if you were so close. I say we had good seats - but the moment the band came on stage, everyone, and I mean everyone, got to their feet. And we didn't sit down until we got back to our car after the concert. I think the last time I've boogied this much was the Neil Diamond concert last year (I do have wide musical tastes!). U2 played a good mix - plenty of the old songs (e.g. Bloody Sunday, Pride, Beautiful Day, New Year's Day), some more recent stuff like Vertigo, and the best of the new album, some of which is quite catchy - I did enjoy singing karaoke style to Unknow Caller! The sound was great, by the way (there were some reports that it wasn't brilliant on the first 2 nights) - crystal clear, but not too loud (though Brendan did get a ringing in his ears until the next morning). What amazed me is that we could hear Bono's voice perfectly over the singing of the crowd (and we did sing along a lot). His voice is in pretty good shape, by the way. When they started out many years ago, I really don't think he had a great voice. He could hit some beautiful high notes, but he could equally miss them altogether. Now, his voice is steady and he can control the high notes perfectly. It wasn't all about the music though - the light show was out of this world. The Claw, as it is called, is like a 4-legged spaceship sitting over the stage, with a 360-degree screen over it - smoke coming out of the spire on top, a disco ball at the top shining light into the night, special effects with the video screen expanding and contracting as needed, mixing Paul Klee-like coloured squares with images of the band, ... Amazing stuff. Go onto the U2.com website and check out the videos. It's well worth it. One final thing to say - what a dreadful leather jacket Bono was wearing - one of these patchwork leather ones with different colours, and the sleeves were too long. Looks like a cheapy from a Tenerife market (and I'm sure it's not!). Awful! You probably noticed from the food I ate in France - I gave up the wheat-free and dairy-free diet while on holidays - no ill-effects. So I think we can safely say I'm not allergic to wheat and dairy products. I've eaten a bit of bread since we came back, but I've stayed off the cheese and pasta and milk, and I'm quite happy as is. If I could find Saint Albray cheese here, I would go for it, though, with lovely French bread! I've been wanting to paint something along the lines of Papunya in the Wet ever since I saw that gorgeous painting on the web. I'm really glad I took a copy of it when I did, as the link is now dead. 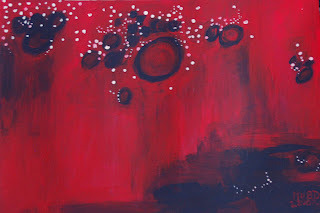 It's a beautiful crushed strawberry red, and I love the dark swirls and the white dots. I want to do something similar, in a bigger format than my usual. I've just completed a small sample. It's worked out quite well, although my red is a lot darker, more blood than strawberry. And I've got it upside down! I printed the original a couple of weeks ago, and I cut it to size, and it must have felt more natural to me upside down. I never realised it until I went back to my post. Because my composition is not as balanced as the original painting, I'm going to keep it the way it is - it's a bit top-heavy but the white dots lighten it. If I turn it around, the white dots look crushed by the swirls. What I enjoyed about painting it was building up the glazes. I used a mix of Liquitex Glazing Medium for transparency (it's glossy and transparent) and Slow-Dri Blending Medium to keep the acrylic paint open longer (so that my colours would blend smoothly). This is a recommended combination from Cheap Joes, and it worked quite well. I'm reading a big book on art at the moment, quite inspirational, and full of practical tips. I'll give you all the details in a future post. They cover drawing, oils, acrylics, watercolours, pastels. There are plenty of paintings illustrating the concepts, and it's one of these lovely big books that I know I'll keep coming back to. 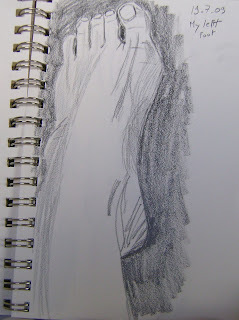 One of the tips is to draw a little bit (even just 10 minutes) every day. The idea is that drawing is the foundation for painting, and you need to practise your craft to hone your skills. I used to draw quite a bit, but have not done so lately, and I can feel it - my eye and hands are not as sharp. I was never a very talented drawer (is there such a word? ), but practise definitely makes a difference. 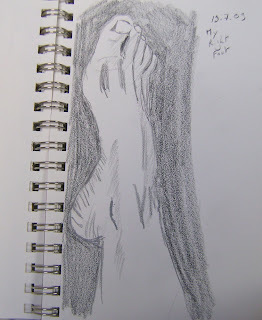 Left hand and feet are a handy subject (pardon the pun). So there we are! I've been a busy bee lately. 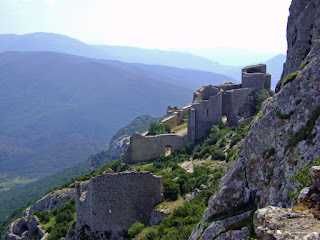 There are still a few "our holiday in the Corbières" posts to be written, but let's move on to our recent readings. I read 2 books while we were away: Jodi Picoult's Second Glance, and Wally Lamb's The Hour I First Believed. The first thing I'll say is that I'm sorry I left Wally Lamb's book behind in our hotel room, in my anxiousness not to go over Ryanair's weight restrictions. It is a big heavy book, but it's a very good read. There are many strands to the story, spanning the American civil war, Mark Twain, the Columbine High School shooting, a women's prison, a family's secrets, a couple's struggle to recover from infidelity and the devastating effects of post-traumatic stress. Full of feeling, very raw in parts. The civil war parts didn't interest me as much as the rest, but they did add to the overall richness of the story. The kind of book I could read again in a few years' time. I'll just have to buy it again, so. By the way, I'm not joking about Ryanair - 15 kg per suitcase and 10 kg for hand-luggage, of which you can only have one piece. And if you have a laptop, a handbag, or indeed any duty-free shopping, it all has to fit in the one bag. And the dimensions for that bag are smaller than what other airlines allow. 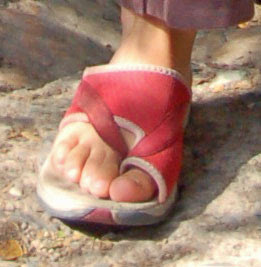 I saw a woman take shoes out of her suitcase and put them on, instead of the light sandals she was originally wearing. The Ryanair staff will not let you get away with any extra weight, even if the other party's suitcase is lighter than 15 kg. They really have killed the fun out of travelling. I was more stressed about my luggage passing the Ryanair inspections than any other aspect of travelling. That said, they are generally good value if you can travel mid-week (but watch out for all the extras - they now have an extra charge if you don't check in online, but you can only check in 15 days before your travel date, so if you go away for 16 days and you don't have access to the internet and a printer in your away location, you'll just have to pay the extra fee!). And they pride themselves on being on time. Even the disembarking from the plane is efficient, unlike Aer Lingus, where you'll be left stranded for 20 minutes with no stairs or no airbridge to exit the plane! OK, enough rants about airlines! Jodi Picoult's Second Glance is a ghost story. Young man's fiancée dies in a tragic accident. He feels guilty about the circumstances of her death, and he's tried to kill himself several times, but has been so unsuccessful that he feels immortal. He becomes the assistant of a TV ghost chaser, in the hope of finding his beloved's spirit. His path intersects that of the Abenaki Indian tribe fighting for the rights to their burial grounds, and that of a scared young woman, who is hiding from her husband. Plenty more characters and stories, and an interesting insight into Vermont's eugenics project. Like all Jodi Picoult's books, the strands all come together, knitting into a very convincing story, and a breath-taking (if somewhat improbable) finale. A great book. And there are plenty more of hers to read. I love a prolific writer! 2 other restaurants we tried out, both in Fabrezan: Les Calicots and Le Clos des Souquets. We were in Les Calicots for lunch and they had a very good choice, including a special country plate with a taste of regional produce, very good overall. I particularly enjoyed my chocolate mousse. Le Clos des Souquets is great for a night out - with 3 different menus to choose from, including an exotic menu, with flavours from the French caribbean. 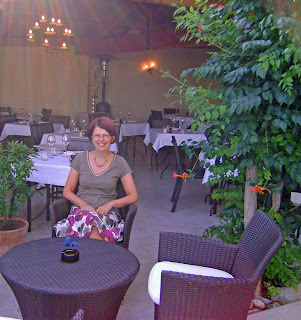 There is a nice feel around the restaurant, which spans 3 areas- a terrace, the main restaurant and the conservatory. There are gorgeous paintings on the walls (except the ones on the terrace, which I didn't like at all - it's all a matter of taste.) We were there on a Friday evening, and there were plenty of locals, always a good sign. I had a carpaccio for my main course, with parmesan shavings and capers, and it was only gorgeous. Brendan enjoyed the duck. Service was excellent, attentive and precise, formal and relaxed all at once. We went back for lunch the following week and both enjoyed a starter of Serrano ham with asparagus. Brendan had duck again for his main, while I opted for the gambas - a very generous portion of 12 big prawns, with a spicy sauce. 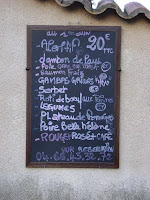 Don't be put off by the restaurant's location on the main road to Lagrasse. There is ample parking at the back and you exit the car park at the back of the property, so no worries about coming out blind onto a busy street. France is definitely the place for food. We had one bad experience, worth noting though. 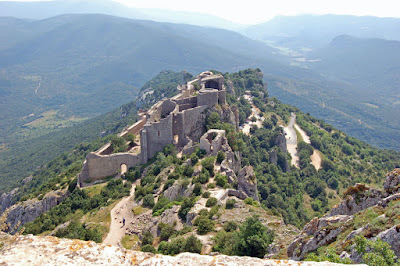 If you're ever in Duilhac Sous Peyrepertuse, avoid the Auberge du Moulin, near the fountain. It looks very attractive, with a big willow tree giving shade to its terrace, but the food is dreadful (my duck was burnt to bits, and was served with an overcooked potato with sour cream on top - everything was brown, including the plates), service is poor (we had to wait 45 minutes for our starter, which consisted of cold meats and salad - I could have prepared it myself in 5 minutes), and I have my concerns about general hygiene. There were dirty plates on a side board, and dirty glasses on the bar counter, left there the whole time we were there. We didn't get sick, but we left before dessert, as we could not endure another horror. The holiday feels like a long time ago already, and the weather here isn't helping. I sat out in the sun for 20 minutes today, determined to top up my tan a bit. This was after a heavy shower, and it didn't last -the clouds gathered up again and I haven't been out since. It's brightening up again, but at 7 pm, it's a bit late to go to the beach. So, here I am, writing a few words, while Brendan is getting dinner organised. You can't beat that for value. Everything was fresh and tasty, simply but well prepared. The slice of cured ham was too thick for my liking (though I have to admit I ate it all), but everything else was very good. The kind of place you can still find in France, and definitely not in Ireland! 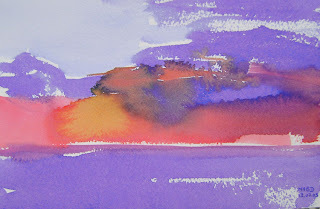 Remember my poor attempts at rendering all the glory of a Maldivian sunset in watercolours? Well, I keep trying. After 2 colourful, but ultimately failed, attempts this weekend, I finally got something that's on the right track. We're not quite there yet, but we're on the way - fewer colours, no mud, no square clouds (OK - the one problem is no reflections in the water - I'm on a learning journey, and I've got plenty of time!). I'm also discovering what paper works best for me. This was painted on dry Arches Rough watercolor block. That's where I get the grain of the paper showing through, in quite an abstract interpretation. The colours mixed into each other but didn't go wildly gliding around the page like they would on smoother paper. 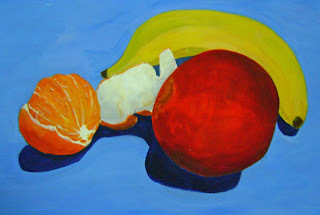 I didn't get to finish my still life before the holidays, but I've agreed with Moya and Des that we'd finish it in September. What we did at the last class was polish the shadows, and add quick-drying oil highlights on the various elements. 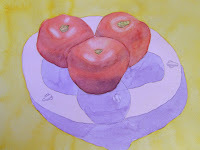 We still have work to do on the apple - right now it looks like a big red ball. When it's done, I'll sign it "MHBD, Moya and Des"
We went to the Bruce Springsteen concert in the RDS on Sunday evening - I don't know many of his songs (Born in the USA and Born to Run are the only 2 I could name before the concert), but I thoroughly enjoyed it. The weather was a bit dodgy - we had one very heavy shower just before he came on stage, but then the sun shone as he arrived, and it was a very pleasant evening, with beautiful skies. 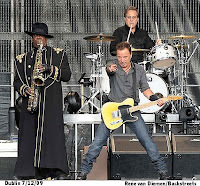 He's a great showman, full of energy, and he knows how to work his crowd, and he kept us entertained for 3 hours or so. Well worth the money, apart from the sound, which I found quite poor at the start. It did improve after a few songs, but you'd think that sound checks would have eliminated any problems (apparently the sound was bad on the Saturday night too). Maybe we were a little too far from the stage, maybe the sound was better if you were closer. But we didn't want to be crushed, so we stayed where we were - I had a little gap where I could see the screens. Those screens were far too low by the way - it was only when they were using the vertical screens that I could see properly. And I wasn't the shortest person there! But I did see the saxophonist's golden nail polish - spooky! 2 songs caught my ear: American Skin (41 Shots) - apparently a tour premiere, and Radio Nowhere. You can hear a clip from the songs by following the links (I couldn't get the link for American Skin to work for me, but you can listen to a short extract on the iTunes Store). The website is great by the way, with a review of the tour, and a set list for each day (with a scan of the actual, scribbled list), a listing of all his songs, with links to the lyrics, and of course the usual merchandising stuff, including mugs and keyrings. I took the picture above from the site itself. I didn't get half close enough for such a shot - they all looked like stick insects from where I was standing! One peculiar thing - throughout the show, a lot of the younger men appeared to be booing him. Those were young men who seemed to be real fans - there were a couple in front of us, who knew the words to all the songs, and seemed to be enjoying every moment of the show. Really strange behaviour. When a lady gave out to them for booing, they said "he'll understand!" Mysterious or what? Another lady later told me that a few other lads told her they were not boooing, they were "bruuuuucing". So it would appear to be the "in" accolade at his concerts. I hope he's in on the secret! 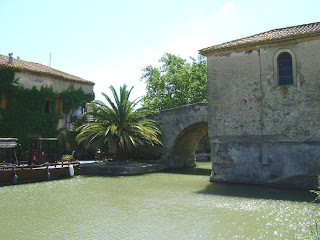 We drove the road that (more or less) follows the Canal du Midi on a couple of days. (Make sure to check out the Wikipedia link to find out why the locks are all oval and not rectangular! And if you want to have a look at pictures of the Canal, you'll find plenty of them on Wikimedia). The first day, we went to Homps, where there was a nice walk along the canal, and the 2nd day, we went to Le Somail, a small town that looks like just another piece of suburbia until you reach the Canal. The area around the Canal, though, is very scenic, with a few old buildings, some nice restaurants, and a nice holiday atmosphere. We had lunch in "O à la Bouche", where I had a very nice "assiette méditerranéenne" - 2 country hams, salad, foie gras, goat's cheese, onion relish and brioche. It was perfect for lunch. We sat on the terrace by the water, where we were courted by the local cat and a few ducks. I'd say it would be a lovely spot to moor a boat for a day, probably not much more, based on the information about the town I found on the web. Not much to do! Did you know by the way that the Canal du Midi is on the Unesco World Heritage List (Lovely pictures in the Unesco site, by the way)? 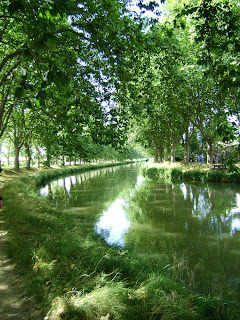 We drove up to the Canal du Midi on a couple of occasions, and found it beautiful, very peaceful, with the constant noise of the cicadas in the plane trees drowning out any man-made sound. You may see us on a boat in a few years - it looked relaxing and fun (even the Spanish kids who had no clue when going through the locks on the Canal de Jonction - and they were at their 6th lock, I think - seemed to be doing OK, with no damage to the boat or themselves). I'd better start watching a few YouTube instruction videos! I did read a couple of books during our holiday, but I also found time for a bit of drawing and painting. Nothing much to write home about, but I like my "3 Tomatoes on a Plate", although they are a little bit paler than I would like. As always, I brought my favourite holiday watercolours, a small box of Derwent Aquatone watercolour pencils (and a deep scarlet red from Faber Castell). I find they're all I need - the blues and yellows are perfect for holiday colours. And the pure red complements the set perfectly. I also bring a small block of watercolour paper, so I don't have to worry about stretching, a few brushes and a small palette. 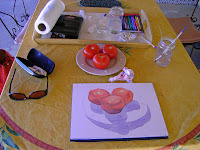 I drew the tomatoes free-hand, and I painted them first (I generally paint the background first), adding shading and highlights before I tackled the plate and background. When it came to choosing the background colour, all I had to do was look at the tablecloth on the table - it was such a sunny colour, it was perfect for the job. We ate those lovely tomatoes the next day, so I had to be quick. It was all done in a few hours. The problems with Eircom Broadband seem to be resolved (I just found out from our neighbours that they lost their Internet access last night too), so I'll post the pictures before it goes down again. 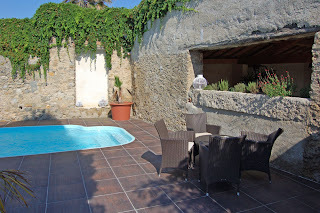 As the flights and house rental dates didn't quite match, we spent the last 2 nights of our holiday in a little hotel in Conilhac-Corbières, called "Auberge Côté Jardin". Brendan had found it on the web, and we were not sure what to expect. We had gone for a rekkie a few days before leaving our house in Montséret (without actually going into the hotel). 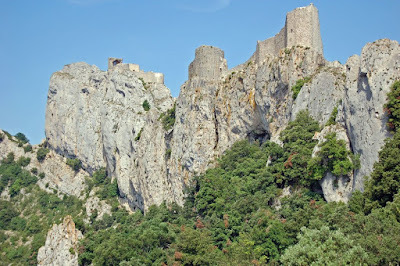 It was on the main road going through Conilhac, a small village just outside Lézignan-Corbières, and we were a bit concerned about the noise, but decided to go ahead with it, as our stay was over the weekend, and there would be no trucks on the roads (thanks to French laws!). There is nothing much to do in Conilhac, and it's cut in two by the main road, but it's quite pretty once you get away from the D6113. There are a few walks up towards the hills, and a few pretty spots around the town itself, but I wouldn't spend more than a couple of days there (I personally think that Montséret is a lot nicer as there is hardly any traffic through it). 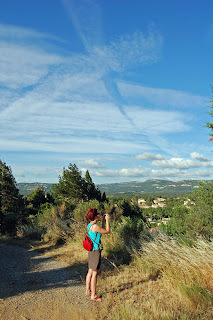 It's close enough to the Canal du Midi, where you will find plenty of scenic little towns for lunch or just a stroll, which is what we did (more about that some other time). We were very pleasantly surprised by the hotel- small (8 rooms), bijou hotel with good staff and delicious food. The whole hotel looks away from the road, towards the vineyards and the hills of the Corbières, and you forget about the road the moment you walk in. Our room was very quiet, had a good bed, nicely-designed bathroom and all the mod-cons. There was a modern pool area within the old walls, and a lovely terrace for pre-dinner drinks. We enjoyed our food both nights - the menu "Saveurs" in particular, and the Maylandie rosé from Ferrals-les-Corbières, a small town nearby. We drove by the Maylandie domain more or less every day - that's why I chose it on the wine list. (Interesting fact from the website: their vines are between 3 and 80 years old!). Service was excellent, very professional and warm at the same time. L'Auberge Côté Jardin is a small family business and it shows. Great attention to detail and I highly recommend the chocolate muffins for breakfast! PS: I've just found out why 2 men were measuring a wall on the side of the road in Conilhac last weekend, a behaviour that I thought was a bit strange. There is an outside art exhibition starting soon, "L'art dand le ruisseau" taking place on the walls lining the small river going through the town - no water going through at this time of the year, and the river bed is one of these man-made ones you see going through towns prone to flooding. They must have been measuring how much space they had for putting up their paintings! It was my birthday earlier this week, and I had a wonderful day, full of surprises, thanks to Brendan who made sure it was all perfect. We had dinner in Bistro One. Food and service were excellent as always. Brendan found his prawn risotto particularly tasty, as was his saddleback stuffed pork (there was a hint of lemon in the stuffing, which gave it a real summery feel). My salad caprese (tomatoes, mozarella and basil) was to die for. It looked just as good as the one on the website. And the Amalfi Lemoncello Creams with raspberry sorbet was the perfect summer dessert. 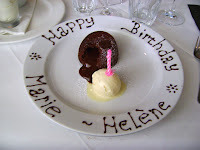 But I couldn't resist the chocolate fondant! Let's face it, Brendan takes better pictures than me (most of the time!). You see, I like my little one-button-does-everything Sony camera, and he uses a more sophisticated one. And he has a good eye for detail and strong composition. Hello again. There were a few of you who were wondering where I had disappeared to! 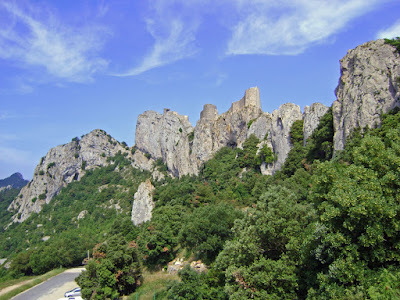 We were on our holidays - down in the Corbières in the South of France, in exactly the same spot as we were 2 years ago, in the same town, the same house, the same bed even (with a new mattress - a lot firmer than the previous one!) - no link for the bed. We did not take a picture of it! You'll see in the links above mentions of the hotel Le Relais de Montséret. Tragically, this lovely hotel is no more. There was a fire last winter, and the restaurant burned down, taking the hotel's owner, Thierry, with it - very sad. According to our landlady, the rest of the hotel was completely untouched, but Thierry's apartment was above the restaurant and it must have burned down very quickly. Apparently, the fire was triggered by an electrical fault. It is such a sad story.